Fear the Walking Dead ends season four with an absolute stinker of a finale. I Lose Myself brought all the storylines together in a bucket of contrivances. Martha (Tonya Pinkins) wreaks havoc again. It makes zero sense why the other characters keep her alive, but absurdity is par for the course here. She gets her due by Morgan's (Lennie James} staff. Just not soon enough to save this abysmal episode. I Lose Myself opens with Al (Maggie Grace) running from the hospital through the basement. She escapes the walkers in a building. Al breaks into a police car, finding a radio and a shotgun. She attempts to call the others, but gets static. Al sees a news van in the garage. She takes a camera, then drives the police car back to the hospital. At the hospital entrance, she runs into Martha, who still has Jim tethered on a pole. Martha tells Al she likes her. She saw her videos. Al gave her subjects just what they needed to cough up their stories. Al turns around to shoot a walker. Martha sets Jim loose on her. She shoots Jim in the stomach, then Martha knocks her out. Al awakens in the back of the MRAV. The group found her at the hospital with the camera. Martha left a recording for Morgan. She promises they will meet again. And she will make him strong. Around a campfire, the group agrees to head off to Virginia. That night Morgan watches the tape again. John (Garrett Dillahunt) approaches. He knows that Morgan will go after Martha to try and save her. He uses a fishing metaphor to describe the futility in chasing her, but Morgan will not let her go. John tells Morgan he will wait for two days at the truck stop with the supplies. Morgan gives John written directions to Alexandria. Morgan walks off into the night. He radios Martha. She's at mile marker fifty-four, where her husband died. The others make it to the truck stop. They indulge in its luxuries, eating, drinking coffee. Charlie (Alexa Nisenson) brushes her teeth. June (Jenna Elfman) and John have a moment. June finally knows who she is and where she belongs. They share a passionate kiss. Al reloads the MRAV's machine guns. Morgan reaches the mile marker. He's disgusted to find Jim in the back seat of the police car. He opens the door and drives his staff through Jim's head. Morgan finds Martha passed out in the dirt near her husband's grave. He puts her in the back and heads towards the truck stop. Martha awakens, but refuses to take antibiotics for her infested shoulder wound. She tells Morgan about her husband's death, and how no one stopped to help them. Morgan replies that she's just stuck. He was there as well. At the truck stop, Al refills the MRAV with coolant. Walkers are approaching, but she becomes dizzy and falls over. Alicia (Alycia Debnam-Carey) shoots them. They take Al inside. June radios Morgan that Al is sick, but its something different. Sarah (Mo Collins) tells her that the truck stop has a powerful transmitter. Morgan might hear her, but he's too far to respond. Morgan increases speed after hearing June. Martha wails that she'll take the medicine. When Morgan opens the safety glass to hand it to her, she grabs his hand. The police cruiser crashes. Martha pulls Morgan out of the car. She writes "I Lose People, I Lose Myself" on his forehead. When he comes to, she's also stabbed a piece of metal into his right thigh. She shows him her fetid wound. Martha wants Morgan to kill her. At the truck stop, everyone is getting sick. June goes to drink a bottle of water, then realizes that all of them have been opened. They have been poisoned. She radios to Morgan what's happened. Martha laughs, she put antifreeze in the water. Morgan tries to respond, but is still too far. Martha cackles, Morgan begins to choke her. He sees his forehead in the glass and realizes what she wrote. He pulls the metal out of his thigh, then handcuffs her to the police car. Morgan sets out on foot to the truck stop. Morgan walks through the night and day. He finds a car, hotwires it, then drives until the tank runs out. At the truck stop, everyone is incapacitated. Al looks at her videotapes, a mother with two children, a soldier, a father and child. She weeps. Al goes to the radio and says she will not let Martha win. Morgan hears her, he's close enough to reply. He tells them the poison is antifreeze. June says they need ethanol to counteract it. There's a truck with ethanol outside, but they are surrounded by walkers. June and Charlie bang on the windows to attract the walkers. The others open the doors and dispatch the rest. They weakly make a break for the ethanol truck. Victor (Colman Domingo) can't open the valve. A group of walkers are almost upon them. Al yells for the group to duck, then unleashes the MRAV's machine guns. It shreds the walkers, but also punches holes in the truck tank. The ethanol pours out unto the street. June radios to Morgan that the ethanol is lost. They are finished. Morgan refuses to give up. He's coming for them. John replies that the world needs Morgan. Charlie and Alicia lay beside each other on the floor. Charlie says, "at least we saw the beach". Victor painfully laughs, he wanted to drink himself to death; but not like this. Morgan walks furiously, but collapses from his injured leg. Walkers come towards him. He stands up and kills them with his staff. At the truck stop, the others are at their end. They hear a truck driving outside. Walkers are being killed. Morgan bursts through the front door. He's driving the beer truck with Jim's "Auggies Ales". He proclaims that ethanol is alcohol. Everyone chugs down the beer. Sarah comments that Jim has now saved them twice. Victor and Alicia drink beside each other. Victor is happy he has someone to drink with. June and John watch as Charlie guzzles a bottle. John remarks this is a one time deal, until she's twenty-one. Morgan goes into the bathroom and washes the writing off his forehead. The group returns to mile marker fifty-four. Martha tore her arm off, then wrote "strong" on her forehead before turning. Morgan kills Martha, then buries her under rocks. Wendell (Daryl Mitchell) asks if it's time to leave for Virginia. Morgan says no. They take Polar Bear's journals and find a denim factory, his base of operations for the supply trucks. Morgan wants to restart the mission. Help those in need. Al replies she has interviews of people in the area. The group establish themselves at the factory. Season four ends with Luciana (Danay Garcia) and Charlie opening the factory gates. A convoy of armored vehicles drive out with the MRAV. Morgan is in the lead as they go to help people. "I Lose Myself" was a weak ending to a roller coaster season. Al has a shotgun in Martha's face, but spouts a monologue instead of blowing her head off? Also, notice how the characters find walkie-talkies everywhere. The poisoning bit hearkened back to scenes where we previously saw Martha tainting the water in the supply boxes. That cleverness was lost by the characters being deathly ill, but strong enough to fight through a herd. Lucky that ethanol was parked outside, only to be a total red herring. Morgan saving the day with a truck of Jim's beer was laughable. How the hell did he find that with a severely injured foot? I suppose Morgan is now a superhero, bringing good to the zombie laden masses. Season four saw the end of the Clark storyline, introduced a slew of new faces, then turns them into literal saviors. 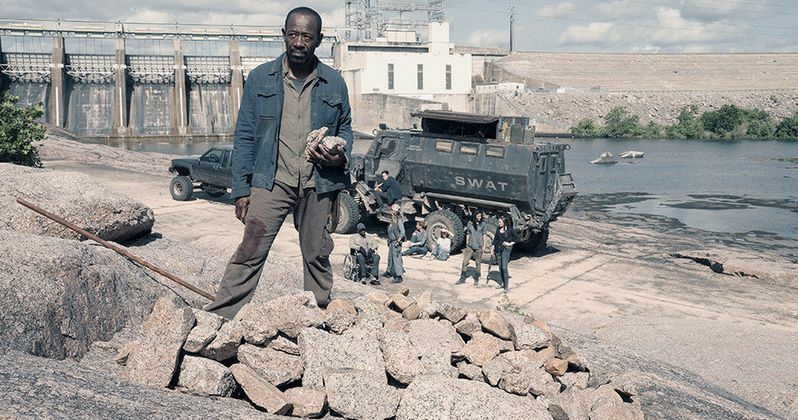 It looks like Fear the Walking Dead won't be heading to Virginia anytime soon. Season five will premiere next summer on AMC.